Financing a business with government support can include grants, loans and the much need tax breaks. Anyone who is considering setting up a company should look at all of the financial support available from government sources. Financial support can be difficult to achieve and there is a rigorous application process with a number of eligibility requirements. Obtaining finances through the government is often overlooked due to the fact that people are unaware that this type of assistance actually exists. Another reason that people miss out on this type of support is that they will already set up their company and then seek funding. One of the main stipulations of government grants is that funding must be applied for before the business is actually set up. The location of the company is also an important factor and those within assisted areas may have a better chance of gaining a grant. Businesses that are looking for financial aid must make sure that they meet the eligibility requirements. There are different eligibility requirements for each type of grant and financial aid request. Some financial aid will only cover the setting up of the company while others may help with working capital for the first year. Always carefully read all of the information that comes with the application before attempting to fill in the application form. Grants and financial support forms can be extremely detailed and complicated. They will scrutinise every detail of your completed application to ensure that you do meet their requirements before guaranteeing any funds. 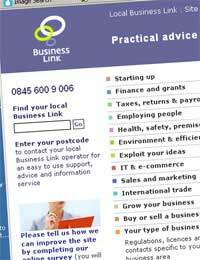 Taking advice and information from local enterprise agencies and Business Link offices will be beneficial. These agencies will be able to give the best advice on the numerous types of government support packages available. They will also be able to help with filling in business proposals and grant applications. Gaining financial support will not just be a matter of sending an application and then receiving the money if successful. There may be meetings with the grant provider to discuss plans, proposals, and costing. In many cases you may need to actually spend the amount of money that has been awarded and then present receipts in order to receive the finances that were guaranteed. Financial providers will give a list of rules, regulations and stipulations that must be followed to the letter. Although financial support will be one of the primary reasons to seek government assistance there are other support areas available. Advice and information on areas such as tax, accounts, business plans and proposals, and where to find the appropriate funding from investors will be invaluable to start-up businesses. Enterprise agencies often employ professional consultants to give advice to new and established businesses free of charge. This will save a lot of money as opposed to going to private consultants who will charge a fee. New businesses should never underestimate the amount of support available through the government. Researching all of the financial support available can bring financial rewards and save costs in a number of areas. Take as much professional advice as possible when researching your options, and always make sure that you meet all of the eligibility requirements before submitting applications.